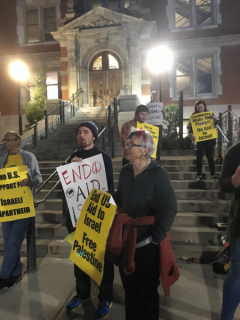 MN protests the Israeli Defense Force at the U of MN | Fight Back! The speakers, Naftali Gross and Aviad Yisraeli, are both American-born Jews who became Israeli citizens and who served in the IDF. The Facebook event advertised that they would discuss the moral dilemmas of their service of protecting Israel, and that Gross served in Protective Edge and that Yisraeli was involved in military operations in Gaza. Attendees of the event had to walk through the protest which was at Folwell Hall’s main entrance and next to a busy U of M bus stop. The protesters confronted the speakers about the role of the IDF in Palestine. The former IDF soldiers accused the protesters of being paid to protest the IDF and tried to divide them from the Muslim community by claiming that all Muslims are homophobic. Only 20 people attended the IDF event; the protest against the event was seen by hundreds. The protesters left feeling good about challenging Israeli apartheid and the U.S. support of the IDF at the University of Minnesota.